The Pro 3-15 Nm Torque Wrench Set offers the precision and adjustability you need; a must for all enthusiasts. You’re getting adjustable torque ranges from 3 to 15 Nm, ideal for most stems, handlebars and seat posts. 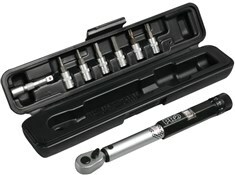 The Pro wrench comes with a compact storage box to keep everything together. I have been maintaing my bikes for years and more recently was fitting a lot of realtively expensive components so decided it would good to know I wasn't over-tightening things. It's easy to use, adjustment is simple and clear. Reassuring to know torque settings are correct. Got the job done a lot quicker as I wasn't guessing torque. There's a lot of these on market but having looked at other reviews this one seemed to be one of the best. You get what you pay for! Got this on offer and for the money its by far the best in its class well built and easy to use.